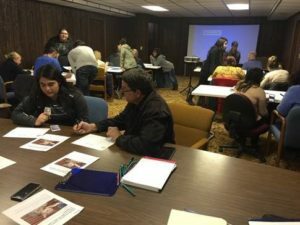 The DC3 International Club and their sponsor, DC3 Assistant Professor of Spanish Jorge Estrella, have developed a Spanish class for business owners and other community leaders. All that is asked, in return, is that participants donate money to the club. The classes run every Wednesday evening, from 6PM to 8PM, in a conference room in the basement of First Dental. The goals of the Spanish classes are for the class participants to learn basic Spanish skills to help them communicate with their Spanish-speaking clientele and for the club members to contribute to better communication within their community as well as to raise money to attend the Hispanic Association of Colleges and Universities National Conference. For more information, contact DC3 International Club Sponsor Jorge Estrella at jestrella@dc3.edu.